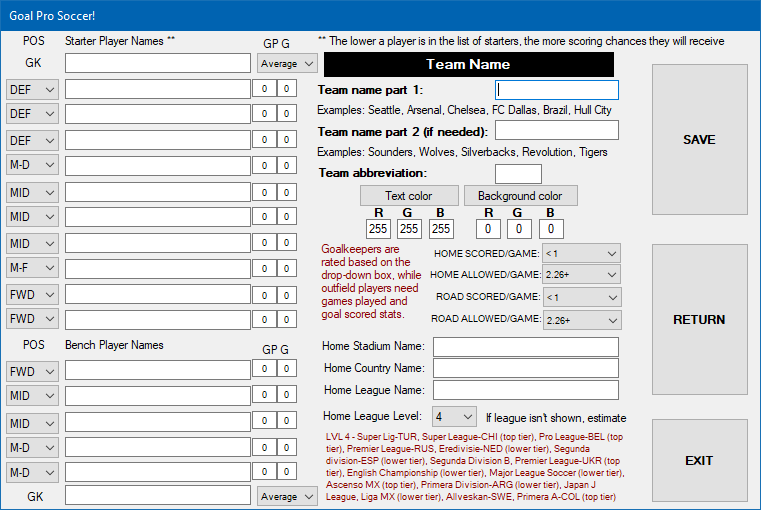 Discussion Forum: Goal Pro soccer pc - Tabletop-Sports...Where Rolling the Dice is King! anyone have the Goal Pro Soccer PC game that is without Windows size problems? Just click on the downloads section. Hope it's what you were looking for. Did you try the XP version as well, even though you're on Windows 10? If so, let me know specifically what the problem is, and I'll try to make a version for you that doesn't have that problem. but why i cannot create a team even i filled all the player's names??? You might not be able to progress in the team generator because there are other blank fields on the page that need to be filled in, or other values that need to be entered. Just a guess. the problem is the team creation screen,it has one player line missing,can you fix it?? However,my screen don't cover the gk subtitiute.